Forme-hotel Montpellier Sud-Est, Montpellier, Francja : Rezerwuj teraz! Forme-hotel Montpellier is ideally located at 10 minutes from the beaches and from the city center of Montpellier, and at 2 minutes from the Arena, the Exhibition Park, the Zenith, the airport, the Montpellier Sud de France TGV train station and shopping malls and leisure activities. The closest tramway station is situated at 1200 meters from the hotel. 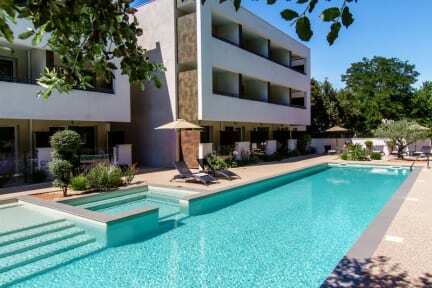 We welcome you in a modern, quiet and comfortable hotel nearby a protected park area. 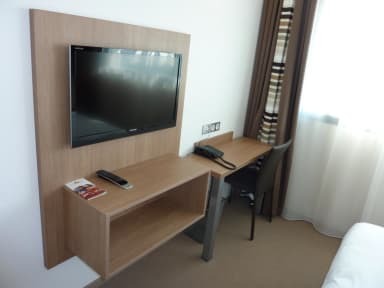 All of our rooms are equipped with a high-quality bedding, TV with satellite channels, Canal+ and BeIn Sports, free Wi-Fi connection, microwave oven, telephone, safe and hairdryer. The superior rooms and the suites have a pleasant terrace and a fully equipped kitchen. Our Fitness room and outdoor swimming-pool (20m) with Spa heated from June to September are available to all of our clients and free of charge. We also invite you to discover the health benefits of our hydro-massage room. 24h Reception, free and secure parking, luggage room, buffet breakfast, packed meal boxes available 24h, free equipment for babies (subject to availability), petanque strip and ping-pong table are part of the services available at the Forme-hotel.